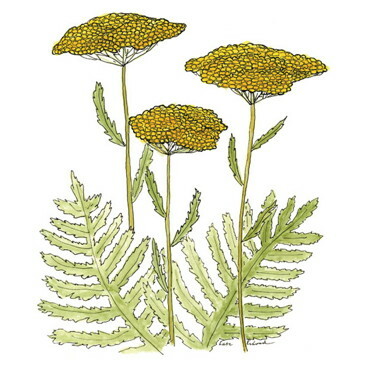 The use of yarrow as a healing herb and magical plant is well documented. It has been utilized by Pagans and Christians alike. The Latin name (Achillea millefolium) is derived from the Greek hero Achilles who, legend has it, carried yarrow with him into battle and used it to stop the flow of blood from the wounds of his soldiers. This is where two of it’s nicknames come from: staunchweed and soldier’s woundwort. The Christianized version of this tale is connected to the French name of yarrow: herbe de St. Joseph. Legend has it that after Joseph hurt himself while working in his carpenter’s shop, the infant Jesus brought him some yarrow and instantly healed the wound. Clearly, this is an adapted version of Achilles story, but I think it’s really fun! Two of the most interesting ancient Christians spells using yarrow are one for demonic possession and another for love. (I recommend neither!) Regarding the first, yarrow was part of a bundle of 13 herbs that were made into a “spew drink” which caused the inflicted to allegedly vomit out the demonic spirit! Seven masses were said over this herbal concoction to which garlic and holy water were added. The finishing touch was that is was supposed to be drunk from an upside down church bell. You gotta admit it’s pretty dramatic! In the name of Jesus Christ, I pluck it from the ground. I hope my true love will appear. She then was told to place the sprig under her pillow until her true loved appeared. This charm is interesting because it is a thinly veiled ancient Pagan charm with the names of Jesus and Mary added to it. This is yet another piece of evidence that supports my theory that many converts to Christianity brought their Pagan traditions with them into the Christian faith. The Church was unable to suppress these traditions so they adapted and incorporated them into the rites and practices of the Church. The final interesting use of yarrow I came across was found on http://www.sacredearth.com. They wrote “A special soup of herbs is the traditional dish for Maundy Thursday, the Thursday before Easter. This soup contained 9 holy healing herbs, one of which is Yarrow. This soup was believed to ward off all sickness and disease and dispel all evil influences for the whole of the coming year.” I had never heard of this before but it fits the history of the use of yarrow quite well. This entry was posted in Herbology and tagged Christian, Herbology, Herbs, magical, Pagan, uses, Wicca, Yarrow. Bookmark the permalink.